Sam Bird come out on top in a race which was absolutely jam-packed with incidents - even by Formula E standards! 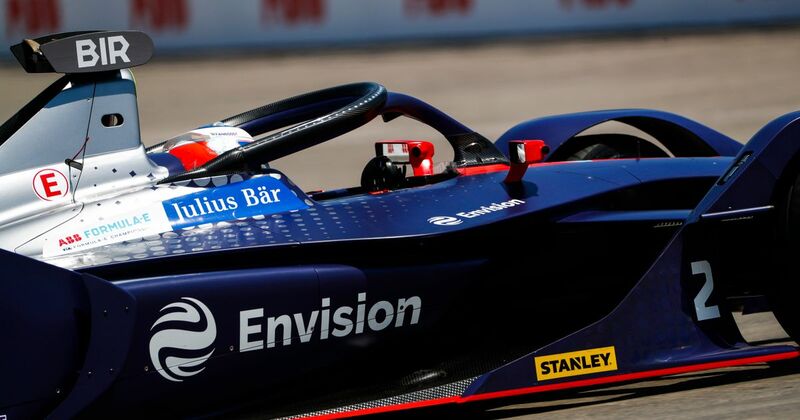 After a surprisingly sedate first corner and opening lap, the Santiago ePrix seemed to descend into utter chaos as high temperatures pushed cars, drivers, and even the track surface to breaking point. There had already been drama ahead of the race when pole-sitter Lucas di Grassi was made to start from the back following a technical infringement, leaving Sebastien Buemi on pole alongside series rookie Pascal Wehrlein, with a lot of the top names in the championship - Antonio Felix da Costa, Jerome d’Ambrosio and Jean-Eric Vergne - also starting towards the tail end of the field. The early stages of the race were relatively calm as Bird moved up from fourth to second. Then the madness began. In a congested midfield, Felipe Massa was unceremoniously dumped into the wall by Oliver Rowland. Maxi Gunther was having a terrific race when his car ground to a halt, and then Stoffel Vandoorne understeered into the barriers and out of the race. By this point, the high temperature (which was getting close to 40°C, making this the hottest Formula E race ever) was having an unexpected side effect - parts of the track were starting to disintegrate. It wasn’t bad enough to force any stoppages, but it was enough to make certain parts of the track strictly single file, with any deviation from the racing line sure to end in disaster. The first to really find this out was, shockingly, Buemi. Under pressure from Bird, he went slightly too hot into Turn 7, hit the wall, and was out. The extremely tight hairpins at the end of the lap were causing all sorts of trouble. At one point Andre Lotterer hit da Costa, who in turn hit Vergne, causing the reigning champ to drop to last (he eventually retired). Later on, di Grassi ploughed into the back of Jose Maria Lopez while the yellow flags were out. That netted di Grassi a hefty post-race penalty, dropping him from ninth to 12th. Another driver to get a post-race penalty was Alexander Sims. The BMW Andretti driver did a great to go from eighth to third, but on his way through the field he nudged Edoardo Mortara ever so slightly, spinning the Italian and costing him two places. The penalty dropped Sims right back down to seventh, just behind Mitch Evans. At the front Bird carried on to victory and become the first driver to win a race in all five seasons - but not without new boy Wehrlein giving him all sorts of grief. Wehrlein had saved his attack mode usage for late in the race and was all over the back of Bird with a few laps to go. The Brit is more than used to putting up a defence, however, and once Wehrlein’s attack mode ran out, he had to slow down in order to manager soaring battery temperatures. Bird had to do the same, but both managed to reach the end without any further dramas. The penalty for Sims promoted Daniel Abt to third, with Mortara recovering to fourth and Robin Frijns taking fifth. Eight drivers failed to finish the race and barely any cars finished without some sort of damage, such was the sheer craziness of the race, mirroring what seems to be happening this season in general. No driver seems able to get any sort of consistency at the moment which means that, despite finishing down in eighth, d’Ambrosio still leads the championship, just one point ahead of Sam Bird. And although da Costa hasn’t scored since winning the first race, he’s still sitting third overall. Update: Bird was investigated for having an underweight car after the race, but was subsequently cleared. D’Ambrosio, however, was given a five-second penalty for speeding during a caution period, dropping him from eighth to 10th and behind Bird in the championship. Is anything ever straightforward in Formula E! ?